Nulab is a team of fun-spirited creators dedicated to creating software the improves team collaboration. With each application and feature we release, we aim to make the lives of teams better. Since its founding in Fukuoka, Japan in 2004, Nulab has developed three collaborative apps — Backlog, Cacoo, and Typetalk. We’ve also expanded across the globe with offices in Amsterdam, New York City, Kyoto, Singapore, and Tokyo. The name ‘Nulab’ is a hybrid of the words ‘null’ and ‘laboratory.’ In computer programming, null is an undefined value. We believe that great ideas can be built from scratch. Masanori Hashimoto, CEO, and Shinsuke Tabata, CMO, met in 2002 through a java community called Mobster. Through the community, they would develop a number of open-source software including a wiki engine, a bug tracking system — the initial framework for Backlog — an application launcher, and a code generator. Inspired by how seeing the positive effects great collaboration can have on a product and team, they decided to start Nulab to create products that would make team’s lives easier. Over 4 million users across 200+ countries. Always look for “nu” stuff to create. We use our products around the clock. The Nulaber next to you will always do their best. Nulab is a global company with six offices across Japan, the US, Singapore, and the Netherlands. 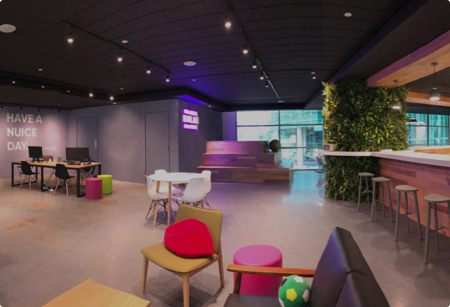 Singapore is the home of NuSpace—a unique community space that offers startups and developers a place where they can come together to work on digital projects, attend tech events, enroll in seminars, and get questions answered about Nulab apps—for free. Get in touch with Nulab!